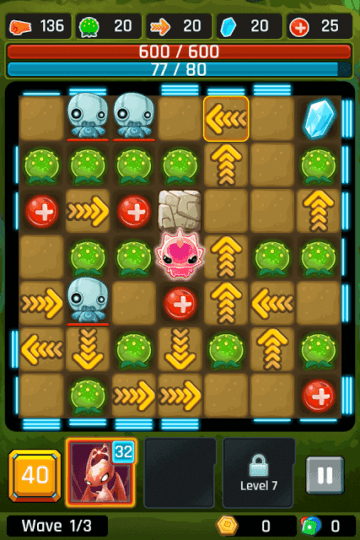 Alien Path is a tactical puzzle game developed by appxplore, creators of the hit match-3 puzzler “Alien Hive”. The game combines role-playing and card-battling elements with an ingenious “path-finding” puzzle gameplay. Players have to tap on special arrow tiles to change their direction and then swipe the screen to make the alien move. The arrows will lead him to his target. The game board has several obstacles, traps, portals and robots. Your objective will be to destroy all robots to advance to the next stage. Some stages will have boss robots that would be tough to beat and you will have to use your brains, get the right arrow combos and make the most of portals, cards and pods to defeat him before he does. In this game, arrows decide the alien’s path. You will have to tap on arrow tiles to change their direction to help him move to his target. Don’t get confused with the direction of the arrows. An arrow pointing up will make him move up when the alien lands on that arrow tile. An arrow pointing right will make him dash towards the right when he lands on that arrow tile. Make your own path by changing directions of arrows so that all arrows connect and lead you to the enemy. After creating a path, swipe to move the alien and let the arrow tiles lead him to his target. Examine the game board carefully. There’s no timer, so take your time and create that perfect path that leads you to attack two robots in one move. Make the most of blue borders to get combos. Hitting those blue bounce walls at the edges of the game board will make your character bounce off them. The more number of lines a wall has, the further your character bounces. While creating a path, make sure the path has several pods so that any nearby robots will take damage while your alien moves towards his target. Get combos by eliminating two or more robots in one move. If you achieve a 2 Combo, you will get 50 percent coins. Eliminating 3 robots in one move will grant extra 100 percent coins. And destroying 4 robots in one move will grant 150 percent coins. Besides pods, you can also take advantage of arrow tiles to inflict arrow damage to robots. How this works? Well, the number of arrows that lead your alien to the robot is added to his base damage. So if 3 arrows lead him to his target, then 3x(current arrow damage) will be the total damage added to your characters starting damage. You can see the damage of a single arrow tile at the top of the screen. To increase arrow damage, use spirit sparks to level up your character. You can also use an arrow-specific supreme spark to max out arrow damage stats. As you progress, stages will become more challenging. Those evil robots can’t be destroyed in one move. It will take several hits before a robot can be defeated. On the game board, tap and hold on a robot to check his HP. Now tap and hold on your character to check its total damage (starting damage + extra melee damage from a power card). If your enemy’s HP is higher than the alien’s total damage, then it will take more than one hit to defeat him completely. Power Card damage: Some power cards add extra damage to your alien’s base damage. Arrow damage: Added to your alien’s starting damage stats when he hits a robot. The number beside the tiny arrow icon at the top of the game screen is the arrow damage. The more arrow tiles lead your character to the enemy, the more damage you deal to enemies. So basically your alien’s total damage = base damage + power card damage (if you have equipped a power card that adds bonus damage to your character’s starting damage.) + arrow damage in case he crossed over an arrow tile on his way to the enemy. The attack stats shown on the upper-left corner of the game screen is your starting damage plus power card damage. Upgrade your character with spirit sparks. Get them by adding friends. Tap “Alien” > “Hive” and then tap on your character to upgrade him. Upgrading your character not only increases your base damage, but also increases arrow damage, health and pod damage. Upgrade power cards that add bonus damage to your character’s starting damage. 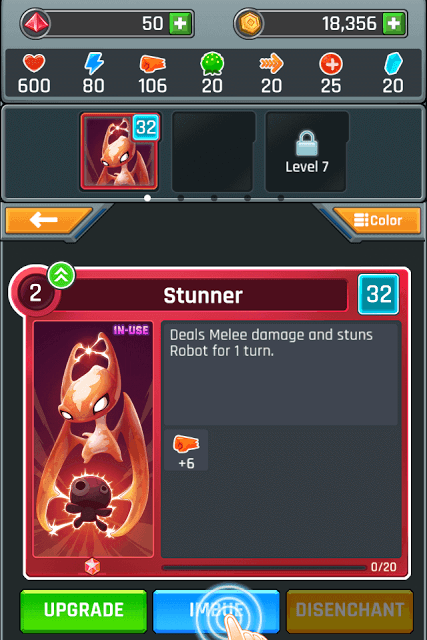 The “Stunner” card is an example of a power card that provides bonus damage to the alien. Collect colored sparks to upgrade and increase its bonus damage. You may get sparks by breaking stones or by completing a stage before a set number of moves. So if a stage demands that you defeat all enemies within 50 moves and you complete it with plenty of moves remaining, you get a “speed bonus” that might contain colored spark or a supreme spark. You can imbue your card with a supreme spark to get high stats bonus. A damage specific supreme spark max outs stats of an attribute. There’s a slight twist to card upgrades in Alien path. Instead of hitting the upgrade button after meeting upgrade requirements, you will have hit the button at the right time to get maximum benefits. In the upgrade screen, you will see a slider constantly moving from left to right and vice-versa. The slider appears beside the stats bonus. You will have to press the upgrade button when the slider is on the green zone to get max upgrade benefits. The slider appears only when you are using common sparks to upgrade. It won’t appear for upgrades that use supreme sparks. Keep adding friends to get spirit sparks. These special sparks can be used to upgrade your hero. Tap “Social” > “Friends” and then tap the “Invite” tab. Send invites to random players and get spirit sparks if they accept your friend requests. 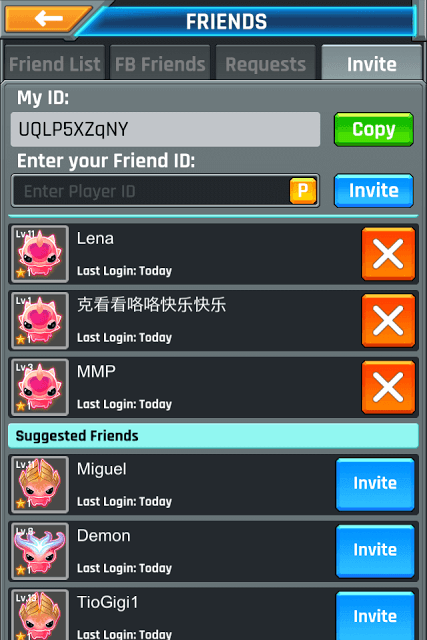 Random players will also send friend requests. You will get spirit sparks when you accept their requests. Another way to get spirit sparks is to copy your unique ID on the “Invite” tab and paste it on forums or the game’s official Facebook page. You can also add your FB friends to get spirit sparks. To claim your rewards, go to Mailbox. Equipping 3 orange cards will give a 10 percent boost to arrow damage. Get 20 gems for Liking the game on Facebook and 20 gems each for subscribing/following the game on YouTube, Instagram and Twitter. Gems can be used to buy card packs. On your home screen, tap the UFO to get a special reward. All you have to do is watch a 30-sec ad to get one. Going through pods on your way to your target deals extra damage to nearby enemies. This will weaken them as their HP decreases. You can then easily take them down in one or two moves. Look for paths that contain several pods in one line, but do examine the board to see whether there are nearby enemies. Look for big red portals on the game board. Moving in to a portal will warp the alien to the next portal on the game board. There are also wall portals on the edges of the game that teleports your character to another wall portal.